You can add the Malwarebytes Browser Extension to protect your Chrome browser by downloading from the Chrome Web Store. This works for individual users, but Group Policy is required to deploy an extension to a large number of users in your organization. Retrieve the extension ID and the update URL of the Chrome extension. To begin, manually install the extension from the Chrome Web Store on your (test) system. The URL of the Chrome extension also contains the extension's ID. You can copy it directly from the browser's address bar. The update URL is the same for all extensions, namely: https://clients2.google.com/service/update2/crx. Installing the extension on a (test) system is not necessary, but recommended. You can test the extension before deploying to your users and can check for any additional, configurable settings (options). Inform your users about these additional options. Enable developer mode. The ID of each individual extension appears. Copy this ID in Notepad. you need this information in the next step. The extension ID is equal to the name of the folder. Open the directory that corresponds with the ID of your extension, in our case ihcjicgdanjaechkgeegckofjjedodee (= the ID of Malwarebytes extension). Open the subdirectory representing the version of the extension. In the root of this directory you should find the file manifest.json. Open this file in Notepad. In the following paragraph you will enter this string in a Group Policy setting. Copy all .ADMX files to your local Administrative Templates store or Central Store C:\Windows\PolicyDefinitions. Copy all language file to the language folder In your local Administrative Templates Store or Central Store C:\Windows\PolicyDefinitions\en-US. To force-install extensions, open your Group Policy Management console (dsa.msc) and go to User Configuration \ Administrative Templates \ Google\ Google Chrome \ Extensions. Go to the setting Configure the list of force-installed apps and extensions and enable it. Now the policy setting is configured. On the next Group Policy refresh and the users automatically receive the required extension. 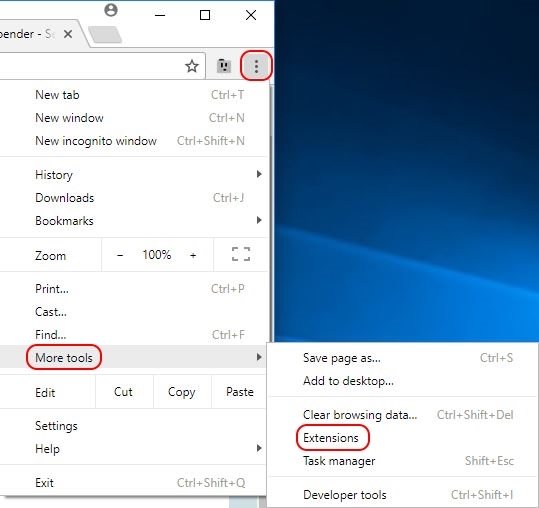 Note: make sure that developer mode is disabled on the extensions tab as it might prevent the extension from being installed. 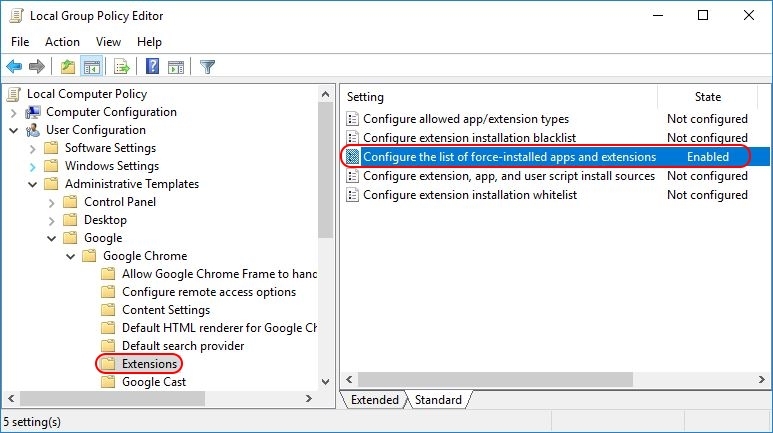 When you remove the extension from the Configure the list of force-installed apps and extensions policy setting, the extension is automatically removed from Chrome for all users to whom the Group Policy applies.